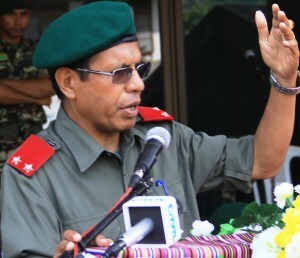 East Timor Legal News 02 September 2011 Source: AFP - DILI - Timor Leste's army chief Taur Matan Ruak resigned from his post on Friday, a senior official said, ahead of a widely expected run for the presidency in elections next year. Deputy Prime Minister Jose Luis Guterres said Major General Ruak had submitted his letter of resignation as chief of the country's armed forces to the cabinet, which was meeting in the capital Dili. "The letter has been accepted by the government," he told AFP, without elaborating on Ruak's reasons for stepping down. The veteran of Timor Leste's resistance struggle against Indonesia's occupation is widely reported to be preparing a run for the presidency in March polls, against incumbent leader Jose Ramos-Horta. In August Timor Leste officially disbanded the Falintil pro-independence militia, which had fought against Indonesian rule for more than two decades. Timor Leste became fully independent in 2002. Around 500 foreign troops under the Australian-led International Stabilisation Force are based in the small country in support of local security forces.